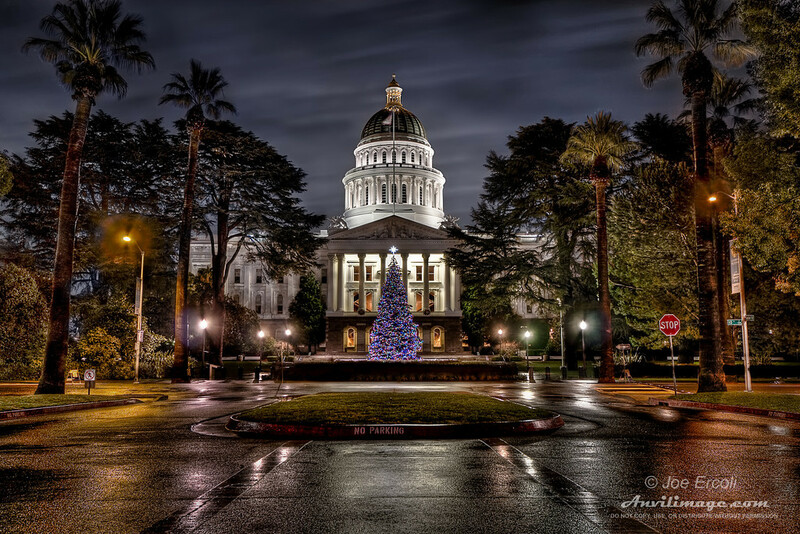 While driving back from Auburn, CA, after a day of wine tasting with my girlfriend, the rain stopped coming down long enough to make a stop off at the state capitol in Sacramento. I’ve been to Sacramento plenty of times on the way to Tahoe or Folsom, but this was the first time that I had actually stopped instead of just passing through. If there was the slightest hint of more rain, I wouldn’t have planned to stop at all and I never would have known what I was missing. HDR Info: This HDR of the California state capitol is comprised of three images shot on a tripod using a Canon 40D through a Sigma 10-20mm lens at 20mm with ISO 100 and f5.6. HDR processing handled by Photomatix and further edited in Photoshop CS4. This entry was posted on Thursday, December 17th, 2009 at 4:00 am	and is filed under Blog, Photos. You can follow any responses to this entry through the RSS 2.0 feed. Daymn Joe… Nice shot! I just watched Trey Ratcliff’s tutuorial… going to have to try some of this HDR stuff out. Perhaps I can hit you up for some tips!